The day Amit Shah filed his election candidature papers from Gandhinagar, BJP workers were enthusiastic in preparing for a series of rallies in the constituency – but they had a complaint: the mercury was touching 39 degree Celsius. They arranged plastic chairs in a shade on the main road in Ghatlodia, the assembly segment of the constituency where the party president was to address voters. As volunteers made frequent trips to fetch water bottles, the talk centred not on corruption or nationalism but on weather. As Shah took the stage, suitably late in the afternoon, corruption, nationalism and other issues came back to the centre stage. This is how the whole election campaign is playing out: At road-shows and door-to-door meetings campaigners and voters both complain about the nearly unbearable heat, while the political message focuses on everything but the weather. Most parts of the country were witnessing mercury in the high thirties in early April itself. This was not the case earlier. Since 2004, when Atal Bihari Vajpayee decided to go for elections earlier than the scheduled September, this is the fourth Lok Sabha election taking place in summer. Veteran political workers and reporters would recall sweating it out during national and state elections in previous decades, but in recent years it’s significantly hotter. Sustainability at the centre of thoughts and actions - climate change mitigation initiatives. Ecological audit of projects and pollution indexing of cities and townships. Guidelines for hreen buildings and energy efficient work places. Citizen’s participation in reforestation, agro-forestry and social forestry. 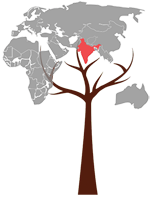 Himalayan Sustainability Fund and National Mission on Himalayas - inter-governmental partnership for coordinated policy making and capacity building across states and sectors. India has become a global champion in addressing the issues of climate change through effective and feasible interventions. We have achieved cumulative installed renewable energy capacity of 76.87 GW as on February 2019, and are on track to achieve our goal of 175 GW by 2022. We will continue our efforts in this regard and make it a popular movement. We will further make all efforts to invite other countries of the world to become members of the International Solar Alliance. We have ensured speed and effectiveness in issuing forest and environmental clearances for eligible projects due to which we have added around 9,000 sq km to the forest cover of the country. We are committed to maintaining this pace through adoption of cleaner practices to make our nation a greener country. We have continuously protected and promoted the interest of forest dwellers, particularly the tribal communities. We have endeavoured to provide basic amenities, such as roads, telephone connectivity and cooking gas connection in addition to houses and toilets, at the doorstep of people living in remotest forest areas. We are committed to continuing our work in this direction. We will ensure the Himalayan states are provided special financial assistance in the form of a ‘Green Bonus’ to facilitate the protection and promotion of forests in those states. An action agenda to place India at the forefront of the battle against global warming and for the protection of the environment. 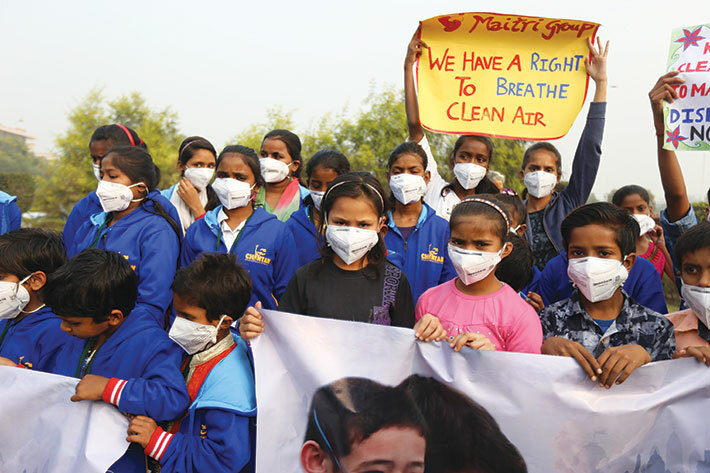 Air pollution to be recognised as a national public health emergency; strengthening of the National Clean Air Programme to urgently tackle the problem of pollution. A comprehensive land and water use policy and plan that will include measures for the conservation of ecosystems and the bio-diversity and wildlife contained therein, without affecting the legitimate rights of local communities. Presentation of national accounts in a form that accounts for the costs of environmental degradation and damage. The annual budget will adopt the core principles of Green Budgeting. 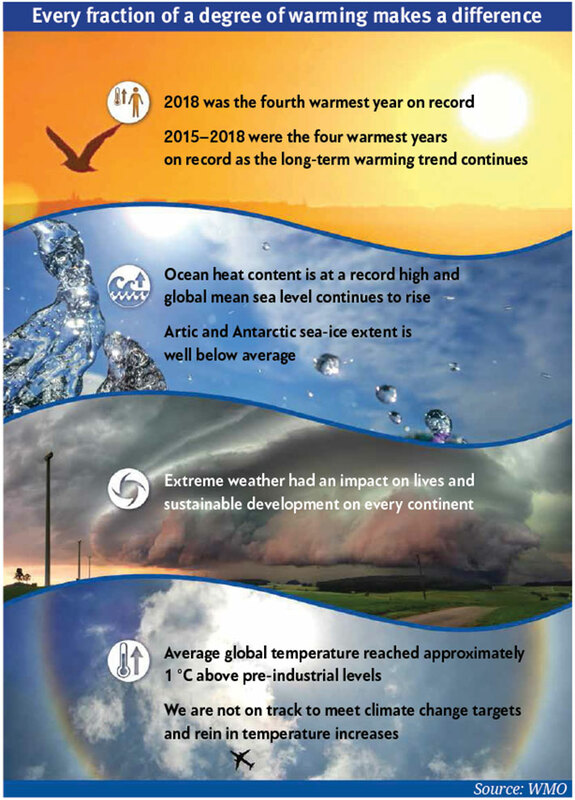 The World Meteorological Organisation, in its March 29 statement on the State of Global Climate 2018, notes that 2015-18 were the four warmest years in recorded history. This year, a scorching summer is promised for the thousands of candidates and their entourages. Skymet Weather, in its monsoon forecast released on April 3, predicted “a rising trend in temperatures in April”, and “its continuation in May is likely to pave way for intense heat before the onset of Monsoon”. Notwithstanding variations from place to place and year to year, this is the well known and well documented phenomenon of global warming, and the accompanying climate change. Curiously, it is altogether missing from the election discourse even as the candidates and voters debate a sundry other issues. The biggest democracy on earth, nearly a fifth of humanity, is collectively drafting the agenda for the next five years and beyond, and it studiedly avoids naming what is possibly the greatest ever threat to the survival of human race. To be fair, the election manifestos of the two leading parties do mention climate change, even if cursorily. In the BJP’s ‘sankalp patra’, prime minister Narendra Modi tells citizens in a two-page letter, “India’s stand on subjects like terrorism, climate change and prevention of money laundering are (sic) setting the global narrative.” Elsewhere, the manifesto mentions it once, listing the steps taken by the NDA government to promote alternative energy sources, along with the promise to continue efforts in this regard. Manifestos are like wish lists; few expect all of the promises to come true. Their words remain in cold print, while the real hot-button factors are the ones that play out in the hustle and bustle of election rallies. In 2014, the BJP had, in promising ‘climate change mitigation initiatives’, pledged to set up a Himalayan Sustainability Fund. Not only the pledge has not been fulfilled, it is not even carried forward in the new manifesto. Beyond a written question in the Rajya Sabha, the pledge did not come up for scrutiny during the five years. Now, in its place the BJP promises to “ensure the Himalayan states are provided special financial assistance in the form of a ‘Green Bonus’ to facilitate the protection and promotion of forests in those states”. The blame for the apathy towards the environmental crisis is certainly not on the political parties alone. 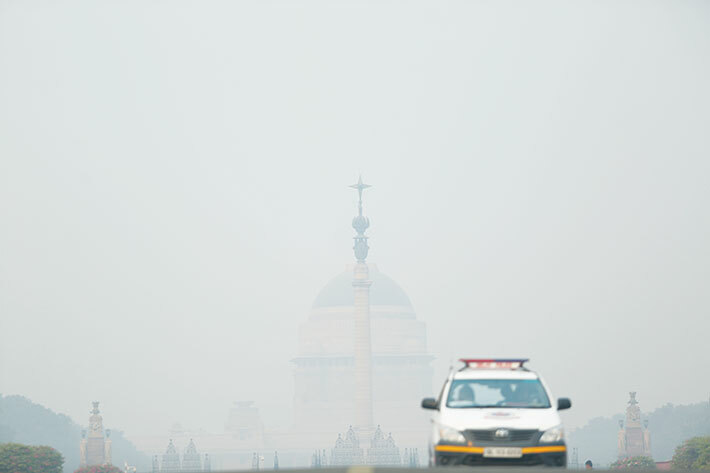 If voters were getting worked up over some WhatsApp messages with shocking graphic details of air pollution in Delhi last winter or water queues in Shimla last summer, the BJP and Congress would scramble to outdo each other in promising clean air and enough water. 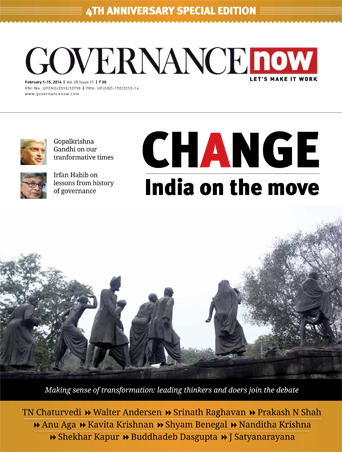 AAP would be relaunched overnight as a green party. But environment has not been an emotive issue, neither in India nor elsewhere, not counting a few experiments in Europe. The governments – politicians and bureaucrats – out of conviction or otherwise do take well intentioned measures in due course. Promotion of solar energy by the outgoing government is one example; push for subsidised cooking-gas cylinder distribution among the rural poor is another. But political leadership has the responsibility of creating awareness and making environment an emotive issue for voters, because what we are staring at is the threat of near-extinction within the next generation’s lifetime, if a majority of scientists and commentators are to be believed. Some background is in order. Pollution began with industries, scientists maintain. Thus, climate change began with the beginning of industrialisation in the 18th century. Europe discovered technologies to exploit the carbon fossil fuel, and it literally changed the world – including its climate. Steam engines and electricity made life far easier, but left fumes and smoke in the atmosphere. Global temperatures have already risen by 1 degree Celsius since the start of the industrial revolution – much of it arguably in our lifetime itself. Glaciers are already melting, sea levels are already rising, heat waves are already increasing, freak weather phenomena and natural disasters are already more frequent. These are not matters of speculation or debate anymore. Optimists believe technology has always found solutions and we will find a way out of the terminal illness the earth is suffering from. But the time to find that solution is running out. There are some, Donald Trump among them, who believe the talk of ‘climate change’ is a conspiracy, but most scientists have given notice of the coming ‘sixth extinction’. The governments around the world have acknowledged the problem, but instead of joining hands for global solutions, each is busy passing the blame and playing diplomatic tricks to reduce the burden of mitigation on oneself. 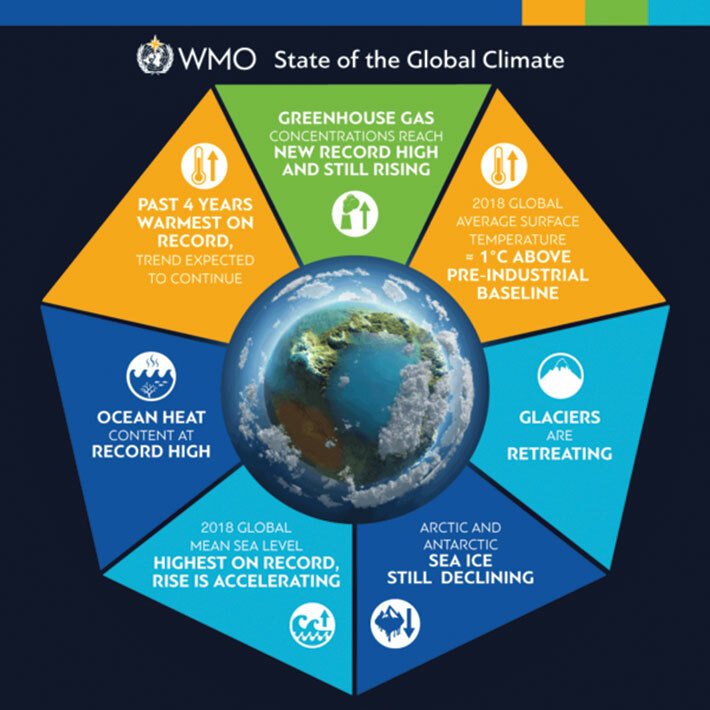 The latest in their efforts is the pledge they have made to try and restrict the rise in global temperature by the end of this century to 2 degrees above preindustrial levels (1850-1900). That would mean drastic cuts in consumption of fuels like petrol that the world has become addicted to. This would mean less economic growth. If ‘climate change’ sounds too abstract to give us sleepless nights, we should consider some predictions that touch upon our lives. For this, there is so much of data and literature that a small forest must have been destroyed in printing them. But we can take The Uninhabitable Earth by New York-based journalist David Wallace-Wells as a representative work. Published in February, the book grew out of a long article for the New York magazine, and is based on a plethora of scientific papers and interviews with leading scientists working on climate matters. Here are some of the forecasts from the book – horrors likely to visit upon us provided concrete precautionary measures are not taken right now. Cities, now home to millions, across India and the Middle East, would become so hot that stepping outside in summer would be a lethal risk—in fact, they will become that way much sooner, with as little as two degrees of warming. 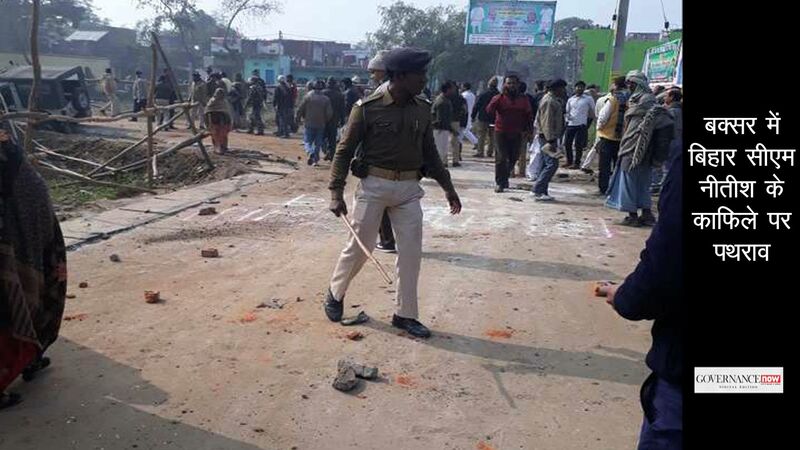 It is against this background that the general elections are taking place, and the parties and people are busy discussing castes and communities and freebies. placed 177th out of 180 countries last year. The election season should have been the time to hold the outgoing government accountable for the diversion of funds, collected from the Clean Energy cess and meant for green projects. This should also be the time to debate the pros and cons of mammoth projects like the widening and expanding of the highways in the ecologically sensitive Garhwal region of Uttarakhand. Calling the river ‘Ma Ganga’ can make it an emotive issue, but the status of the Ganga rejuvenation programme is not one. So, it is understandable that no election rally would talk of the underachievement of renewable energy targets. By the same token, Rahul Gandhi is not going to be challenged on Congress governments’ environmental mismanagement even after Indira Gandhi woke us all up to it in 1972 itself. The Congress needs to explain how it will square its promise of making India a manufacturing hub for the world, while also dreaming of putting India at “the forefront of the battle against global warming and for the protection of the environment”. 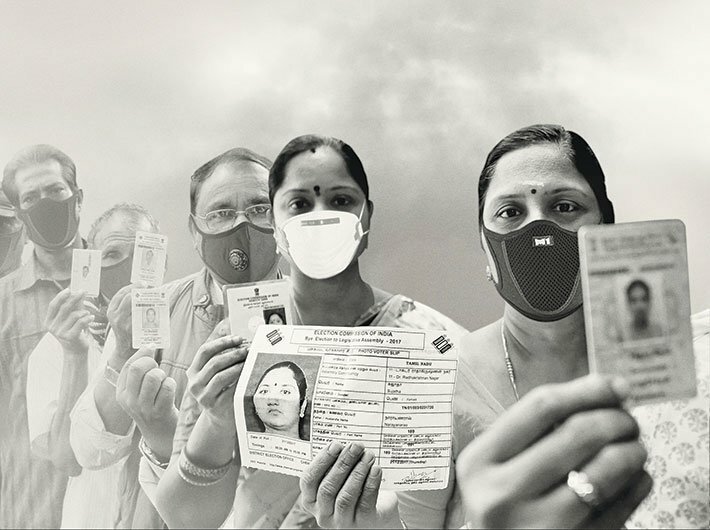 When the air is so polluted that breathing is called the new smoking, and the State of Global Air 2019 report says the lifespan of an average Indian is cut short by 1.5337 year, it is utter myopia if the elections are fought on identity politics. Less than a year ago, the NITI Aayog brought out a report on ‘Composite Water Resource Management’, giving dire predictions. “India is suffering from the worst water crisis in its history and millions of lives and livelihoods are under threat. Currently, 600 million Indians face high to extreme water stress and about two lakh people die every year due to inadequate access to safe water,” it said, adding, “The crisis is only going to get worse.” Moreover, “By 2030, the country’s water demand is projected to be twice the available supply, implying severe water scarcity for hundreds of millions of people and an eventual ~6% loss in the country’s GDP.” No wonder, in Ghatlodia, once Amit Shah’s assembly constituency, and other parts of Ahmedabad, the municipality supplies water for no more than half an hour a day. The next war might be fought on water. Maybe, the next election too should be fought on water. And the environment.